Jack Fisher, M.D., and Eugene Garfield, Ph.D.
San Diego, Calif., and Philadelphia, Pa. Prior to the 27th meeting of the Plastic Surgery Research Council in San Diego, a 2-day workshop was held; topics included time management, fund-raising techniques, and information science. The last topic was skillfully discussed by Eugene Garfield, Director of the Institute for Scientific Information in Philadelphia. Parts of his half-day seminar, including ideas discussed that day and surveys completed subsequently, are assembled here for the interest of all plastic surgeons who are confounded by the challenge of keeping pace with the information deluge. Throughout the nineteenth century, physicians approached practice with little more than the information passed on to them by their own family doctor. Faced with a problem, physicians could not rely on books; few were available. Only a neighboring colleague might occasionally be called on for advice. Journals were introduced toward the end of that century and later proliferated along with textbooks and other bound references. Today, periodicals are not just routine; they are redundant. More than 6000 are indexed by the Institute for Scientific Information. Six hundred of these include all that is considered significant in biomedical science. Yet the plight of the twentieth-century physician may not be dissimilar to that of his or her nineteenth-century counterpart. Keeping up with the new information of a given specialty is still difficult. Maintaining a modern overview of medical science is no longer feasible. Physicians are confronted with an abundance of sources, a veritable haystack of excess information in which they must find the hidden needle. Information science is a relatively new field that strives to find methods of secondary information retrieval that will reduce the time a physician takes to locate precise answers to a specific question. The Institute for Scientific Information is one organization now providing a variety of information services. Current Contents is the Institute for Scientific Information�s weekly current-awareness tool (Fig. 1). Current Contents publishes the tables of contents of the most important journals, allowing physicians and scientists to save time by glancing through Current Contents� pages rather than by traveling to a biomedical library. Author addresses are provided to facilitate communication and the ordering of reprints. Users also may select a limited list of journals, based on review of the contents, and then send an assistant to the library for them. Located in the back of Current Contents is the Weekly Subject Index. 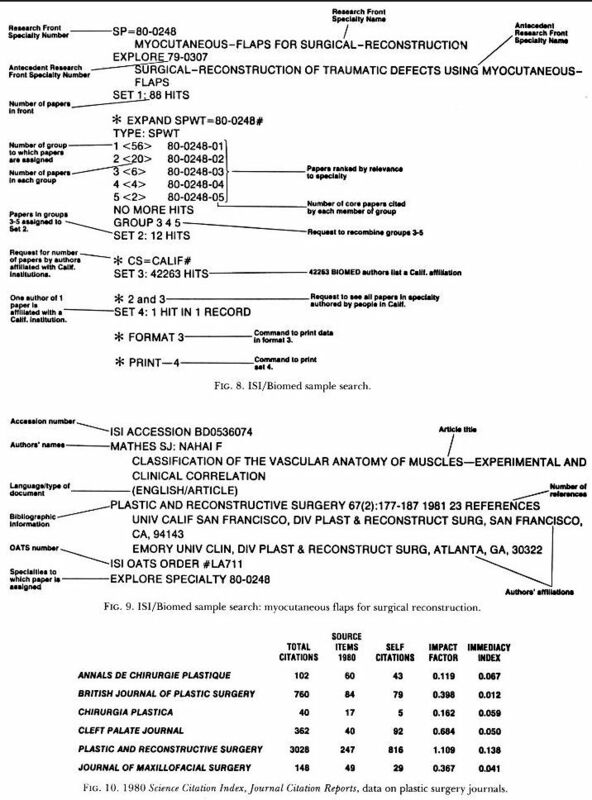 If the user�s interest is mammaplasty, page numbers for all articles on that subject are listed (Fig. 2). Physicians can also follow the work of specific authors, learning where to write for reprints (Fig. 3). The Current Contents index helps generate 10 million reprint requests each year (Fig. 4). Some critics have challenged the efficiency of requesting reprints by mail, while others depend on this method for ensuring rapid flow of very selected information across their desks. 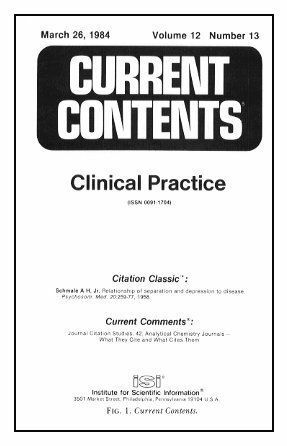 Another useful information aid is the Science Citation Index, probably available in a nearby medical reference library. The Science Citation Index is the Institute for Scientific Information�s major retrospective searching tool; its principle is simple. Almost all papers, notes, or reviews contain citations or references that refer to publications providing precedent for the author�s statement. In other words, a relationship always exists between a cited work and the articles that reference them. Let us suppose you wish to update yourself on a specific article. Using the Science Citation Index, you can easily find all subsequent publications citing that particular reference (Fig. 5). 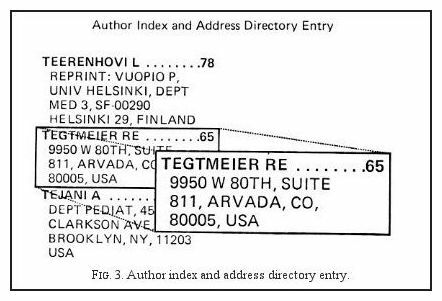 If you do not have the names of specific authors on a subject of interest, then you must begin with the Permuterm Subject Index. It includes every significant word in every title covered by the Science Citation Index. Furthermore, each word is permuted, that is, paired, with every other significant word in the title (Fig. 5). Current Contents and the Science Citation Index are useful for staying up to date in any field, as well as for in-depth research projects. Rapid access to new information or to the solution of a problem requires a computerized retrieval system. ISI/Biomed is an online system for use by anyone with access to a computer terminal. It can provide even the inexperienced searcher with an immediate bibliography. ISI/Biomed delivers highly targeted information because it has been designed to reflect the specialty structure of science. Using a technique called citation analysis or co-citation clustering, patterns of interaction between research fronts permit identification of areas in which intense research activity indicates rapid progress. Here is how co-citation analysis works. Figure 6 shows Science Citation Index entries for two papers. Bibliographic information on these papers is also listed. Lines have been drawn between citations these papers have in common, in this case, eight papers. This is a co-citation cluster. Our assumption is that these are the most important papers in this area, a fact that can be proven. ISI/Biomed currently draws articles from 1300 journals and has done so since 1979. A total of 230,000 articles are added each year; the total now approximates 700,000. Subscribers are provided a guide to several thousand research front specialties. All significant words in a research front appear alphabetically. For example, if you are interested in surgical reconstruction using myocutaneous flaps, you might look up the word phrase surgical reconstruction. 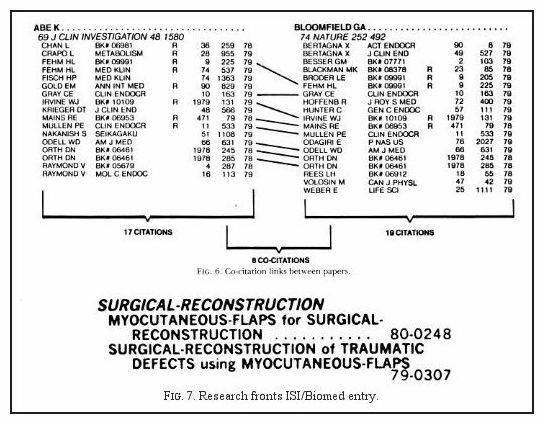 Under this heading is a specialty entitled myocutaneous flaps for surgical reconstruction, a category relevant to the intended goal (Fig. 7). The number for this front is then keyed into the computer terminal. On your screen (Fig. 8) appears first a confirmation of your entry numbers, then the number of hits or papers that appear during a given year. For 1980, that number would have been 88. If this number is excessive, you can rank the papers by co-citation clusters. Fifty-six papers cite one core document in the cluster, 20 cite two or more papers, etc. We then take a look at the 12 papers most relevant to this field because they cite the greatest number of core documents. Suppose now that you want to know of important work done in this field by investigators in California. It is a simple matter to ask ISI/Biomed for articles authored by those who are affiliated with California Institutions. Of 700,000 articles in the system at that time, 46,263 were written by Californians. Next we ask which of the 12 most relevant articles is in this geographic pool. We connect sets and find that S. Mathes works in San Francisco, California, and has contributed 1 of the 12 key papers (Fig. 9). ISI/Biomed can now print out the entire bibliographic reference. You could, if you wished, mail to ISI for the entire paper, or go retrieve it from the library, or call the author directly to discuss the work. Expanded application of citation analysis offers opportunities to examine a specialty�s selection of journals. It is even possible to use these data to select the most appropriate journals to subscribe to. Citation analysis also helps the writer to submit his or her paper to the most appropriate journal or journal audience. Journal Citation Reports are included with each annual cumulation of the Science Citation Index. 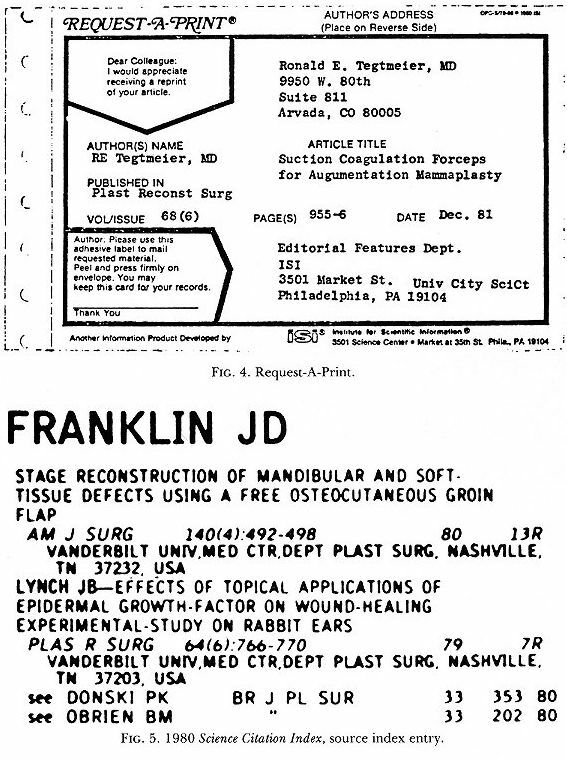 Figure 10 lists several journals publishing plastic and reconstructive surgery articles. 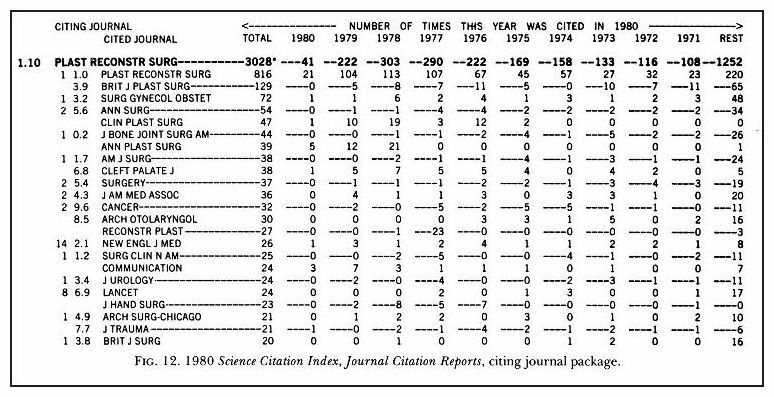 The table includes papers published in 1980, the number of self-citations, the impact factor (a measure of the frequency with which the average cited article in a journal has been cited in a particular year, and finally the immediacy index (a measure of how quickly the average cited article in a particular journal is cited the same year). The results show that Plastic and Reconstructive Surgery is cited more than other journals on the list. Plastic and Reconstructive Surgery also enjoys the highest immediacy index, which means that its articles are cited sooner after publication than articles published in other listed journals. Journal Citation Reports also shows that Plastic and Reconstructive Surgery was most frequently cited by journals in plastic and in general surgery and less frequently by otolaryngology and oral surgery journals (Fig. 11). Readers can also see which journals that articles appearing in Plastic and Reconstructive Surgery are likely to cite. Plastic and Reconstructive Surgery cites itself most often, then the British Journal of Plastic Surgery, followed by Surgery, Gynecology, and Obstetrics (Fig. 12). Use of the Cited Journal Package and the Citing Journal Package together allow the information scientist to follow the trail of scientific information from discovery to application. In this way, a particular journal can be situated in a chain of periodicals. If a resident wished to determine which journals were most important for a core collection in plastic surgery, he or she would select Plastic and Reconstructive Surgery, perhaps also the British Journal of Plastic Surgery and Clinics in Plastic Surgery. The future very definitely lies with advanced computer applications. In 1959, there were only 14,000 terminals in the United States. During the recent personal computer explosion, millions of terminals were purchased. Conservative estimates are that 60 million will be in use by 1990. The Institute for Scientific Information currently provides an expanded system, built on its experience with ISI/Biomed, but applicable to the personal home computer. Its name is Sci-Mate. Sci-Mate gives you access to the Institute�s massive interdisciplinary data base as well as other Data bases, such as Medline. Through a Sci-Mate terminal, users can search the Institute�s as well as other data bases. Information can be retrieved as well as stored in your office or home computer. It also enables you to search your own personal reprint collection as well as patient records or other texts1. Here is one scenario for the future. Imagine yourself at your personal computer in the office or at home. The system is capable of accessing larger data bases stored in distant computers. You are beginning a new project and find that articles ordered from your library are insufficient or inappropriate. You do not want to see a lot of articles because at this point you are narrowing your objectives. So you enter the journals most likely to publish information on the subject. Then you enter a few key words. Of the references displayed, two look very good. Then you look for other articles that cited one or both of these. You have created your own information cluster. If your work is interrupted by clinical responsibilities, you can hold the information in your own computer�s memory or take up where you left off at an alternate terminal in your home or office. In time, you will be able to print out on demand the abstract, eventually the entire article, or you will be able to contact by computer the appropriate colleague who is working closest to your own problem. Now you will be like that nineteenth-century physician who consulted his neighboring colleague, except that you can achieve more instantaneous contact with an infinitely greater choice of consultants. San Diego, Calif. 92103 REFERENCE 1. back to text Garfield, E. "Sci-Mate 1.1: Improved customer services and a new version of the software for personal text retrieval and online searching". Current Contents 8: 3, 1984.